1. Gold Layer Necklace with Green Amethyst by Landon Lacey. 2. Black Rainbows Beaded Layer Necklace by Unique Creations BB. 3. Black Statement Necklace by Get Noticed. 4. Long Beaded Necklace by Via Minimalist. 5. Gold Double Strand Necklace w/Blue Crystals by Alin Yerushalmi. 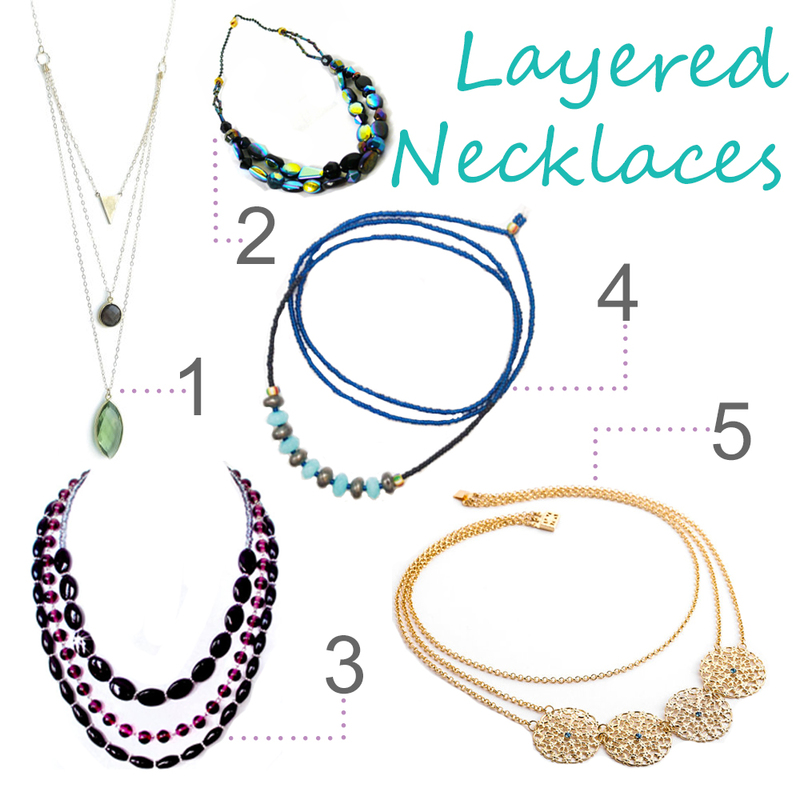 This spring, everywhere I look, I see layered necklaces. These beautiful jewelry pieces run a wide gambit of styles. Multiple thin chains and delicate pendants mixed together look beautiful and feminine. Heavier beaded necklaces in bold colours make a bolder statement. No matter what style you choose to go with, the layered look seems perfect for accentuating lower springtime necklines. In the photo collage above, you can see some of my favourite layered necklaces from some amazing Etsy artisans! I’ve made a couple of sample layered necklaces to add to my personal collection. The first necklace is made from a variety of small glass beads in varying shades of blue. It measures approximately 48 inches in length and can be worn in several layered styles, including as a bracelet! The second necklace features Swarovski Crystals in a green ombre colour scheme on delicate silver chains. Remember, any of Poskett’s lovely pendant necklaces would be a great addition to your layered necklace look! Next > Win a Farrah Pendant in the Spring Time Give Away!